So I thought about doing this for so long but never got around to doing it until now. So I'm making a tutorial thread for the sake of sharing my tips & tricks to everyone. Enjoy! How To Do Lettering in Clip Studio Paint, Jackster's Way! Anyways, for years I've been using Adobe Illustrator to do my lettering for my comics (thanks to Comicraft for teaching me), but after a while I went through some struggles when taking the Illustrator route. Such as importing your lettering to your comic and making further edits to it if it doesn't look right. 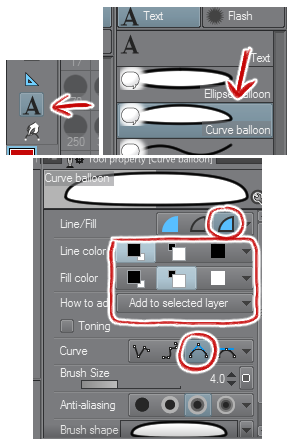 While you can do this in Photoshop if it's a Smart Object, you cannot do this in Clip Studio Paint. You have to rasterize it in order to put it in your comic. Don't you wish you can make edits to your lettering in CSP? Don't you wish you can even DO lettering in CSP? Well look no further, as I managed to at least find a workaround to this! If you may or may not know, CSP has its own lettering feature. While it is useful, it doesn't entirely have all the necessary stuff needed similar to lettering in Illustrator. I managed to come close to emulating the professional lettering gig after some fooling around, as demonstrated below. So how did I do it? Well sit down, shut up, and I'll tell you. Okay, first were gonna need some text. So put in whatever you want to type in. Add in four corners and voila! You have a speech bubble! Now look at it. It's misaligned and junk. Hardly straight at all. That's where my favorite part comes in. Go to the Vector Control sub tool group, then Pinch Vector Line, and for this part we'll use these settings. Note: CSP will have the Pinch level and Effect Level on the Indicator (i.e. the five blocks) as the default settings. If you want to change it to the slider as shown above, just right click on it and choose Show Slider. Now then, when you click and drag on the corners of the bubble, look what happens. Instant Vector Magic! Fix each the corners until it looks straight enough. Yikes! Time to make those tails the right way. Now there are 2 ways you can do this: the easy way (the way I do it) and the mildly hard way. We'll start with the easy way. So what's so easy about the easy way? Simple. You draw it. Go the Text sub tool group again, then click on Balloon Pen, and we'll use the settings below for this demonstration. Note: Make sure the brush size matches that of the brush size of the bubble, that way you'll get the perfect line width for them both. Now with the Balloon Pen in hand, just simply draw the tail in. Magical, ain't it? If you have a shaky hand however, not to worry! You can use the Stabilizer of that. It even works great with Lazy Nezumi as well! But if you have a REALLY shaky hand, or just want to make that perfect tail, then we have no other choice but to go to the mildly hard way. This way works kind of like using Adobe Illustrator, but with some more tweaking involved. And just click and the drag the curves until you have somewhat of a tail. Now click the anchor point at the end of the tail, right click, and select Switch Corner. This will turn the anchor point from curved to straight, so you'll be able to get that pointed tail in no time. With that, just keep on touching up the tail to perfection. Now you know why it's mildly hard, because it's a longer process than just drawing it. 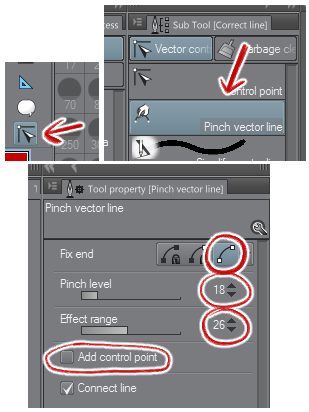 You can even use the Pinch Vector tool to modify. Just make sure to memorize where the anchor points hidden inside the bubble are if you plan on widening the tail a bit. Sure, you now know how to make a balloon, but what if you want to use your favorite inking brush on it? Or just simply draw it? You can do that too. But you're going to need to draw it on a Vector Layer if you want to modify it the same way you did on the other one. 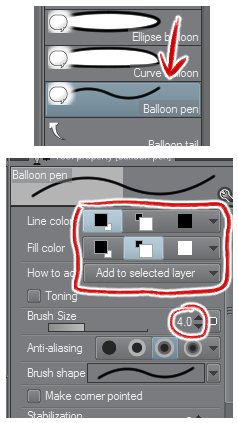 To do that, just go to Layer>New Layer>Vector Layer, or just simply click on the Vector Layer icon in the Layers Palette. This Vector Layer will work with just about any kind of brush you throw at it, premade or custom. Just note that you cannot use the fill tool on it. So to fill in the speech bubble you need to fill it in a separate Raster Layer. 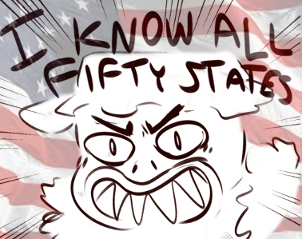 Anyways, with that crap out of the way, let's draw it. We'll be drawing it with a ruler. No not that one, you kindergartner! CSP's set of rulers. Go to the Ruler sub tool group, then Curve Ruler, and select the curve to the Quadratic Beizer setting. Set up the balloon the same way you did with the Balloon tool, select your favorite brush, and draw away! So you drew this bubble but you want to modify it a bit further but you can't because you just drew it. Not to worry! Thanks to you for drawing it on that Vector Layer I told you about, you can fix those pesky corners too! Just make sure you have Connect Line checked, then remember the starting point of your line and push it out a little so it will snap in place as one whole line. Now to draw that tail. Just draw that tail as you normally would (the easy way), and here's where it gets fun. Go to the Eraser sub group, click on Vector, and with one fell swoop, the lines are gone! Just remember to make the brush size reasonably small. And there you have it! 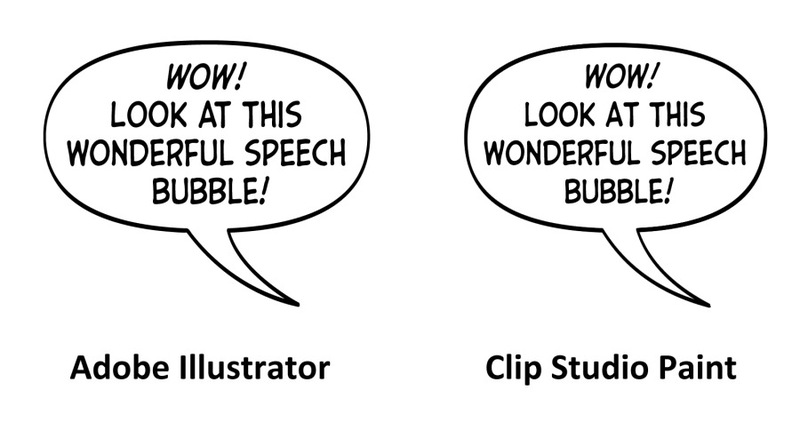 You did a speech bubble in CSP! Congratulations! Pat yourself in the back for a job well done. I'm hoping to make more of these tutorials later or when I have the time. But for now, tootles! as someone who's struggled with good bubbling/lettering, this guide is godsend. thanks!